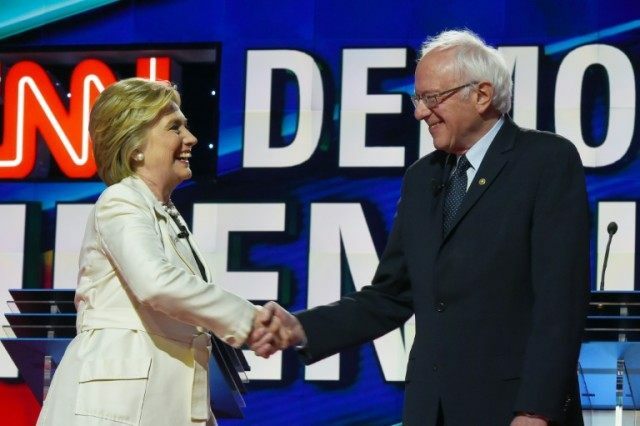 New York (AFP) – Hillary Clinton and Bernie Sanders came to blows in a heated US presidential debate in Brooklyn, battling to win as many votes as possible in their increasingly acrimonious race to clinch the Democratic nomination. The ninth Democratic presidential debate, held in the ultra-fashionable Duggal Greenhouse in the Brooklyn Naval Yard boasting stunning views across to Manhattan, comes just five days before the key New York primary. The former secretary of state holds a 13.8-point lead over the Vermont senator in the New York polls and needs a big win in next Tuesday’s primary after losing seven of the last eight contests to her leftist rival. The two candidates spent the first half of the debate at each other throats, attacking each other over the longevity of Clinton’s support for the $15 minimum wage, her political judgement and Sanders’s record on gun control. The Brooklyn-born Sanders mocked Clinton over her ties to Wall Street and her insistence that she stood up against the behavior of banks when she was New York senator from 2001-09. “Secretary Clinton called them out, oh my goodness they must have been really crushed,” he said. “Senator Sanders did call me unqualified. I’ve been called a lot of things in my life, that was a first,” she said. “Questioning my judgment, well the people of New York voted for me twice to be their senator,” she said. Sanders, who calls himself a democratic socialist, must capitalize on his momentum to beat Clinton in her adopted home state to keep alive his dream of wresting the nomination from the Democratic frontrunner. His passionate call for a political revolution has galvanized young people and he spent Wednesday addressing an enormous crowd in New York’s Washington Square at an event his campaign said attracted as many as 27,000 people. But mathematics are in Clinton’s favor. The former New York senator has won a commanding 1,790 delegates compared to 1,113 for Sanders, putting her on course to scoop the 2,383 needed to secure the party’s ticket for the White House, where she last lived as first lady from 1993-2001. It set the stage for a slew of acrimonious blows at the debate in the borough which Clinton has made her campaign headquarters. She ignored a question asking why she would not release transcripts of paid speeches to investment banks while Sanders promised to release his 2014 tax returns on Friday. “Jane does our taxes, we’ve been a little bit busy lately, you will excuse us,” said Sanders testily of his wife when asked why it had taken him so long. Clinton has released years of tax returns. Clinton criticized her opponent for not detailing how he would implement his sweeping promises to carry out a political revolution. “If you go and read Senator Sanders’ long interview with the Daily News, talk about judgment and the kind of problems he had answering questions about even his core issue, breaking up the banks,” she said. She also highlighted his record on gun control after a Connecticut judge ruled Thursday that families of the victims of a 2012 shooting at an elementary school can sue the gunmaker whose rifle was used. The state also contributes 44 superdelegates, and the rules, which allow only registered Democrats to vote, are likely to favor Clinton. Sanders has performed best in primaries that are open to independent voters.